A brand new future awaits! Awaken your true potential with BFE-D-BT01, “Unleash! Impact Dragon!!”!! Go on another adventure with Gao as he make new friends and teams up with old ones! 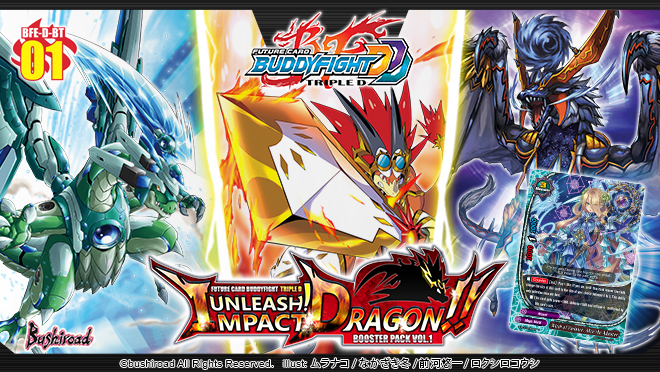 Many powerful monsters called Impact Monsters will also make their appearance! Monsters from 《Dragon World》, 《Star Dragon World》, 《Darkness Dragon World》 and 《Magic World》 will all be included in this product. Strike! With the power of the Impact Dragon!! 129 types of cards RRR: 8 / RR: 12 / R: 30 / U: 30 / C: 45 / BR: 4 (Parallel) + SECRET: ?? 1 PR card will be randomly inserted into each display (5 types in total)! Parallel foils of Commons, Uncommon and Rare Cards are randomly inserted in packs!